It’s hard to pick apart the value for money in much of menswear. But cashmere is particularly difficult. There are Uniqlo sweaters for £39.99 and Ralph Lauren ones for £395. What could possibly explain the difference? A recent article in The Economist’s spin-off magazine Intelligent Life went some way to an explanation. Apologies for merely reporting their investigative journalism, but it’s good stuff and I know it is not distributed everywhere in the world. Cashmere used to be universally expensive because its import into the European Union was limited. I don’t know the facts in the US, but a few years ago there seemed to be a flood of cheap cashmere here in Europe. This was because the import quotas were raised in 2005. Suddenly Scotland and Italy did not dominate the market. At the same time, many Chinese factories had switched from just producing cashmere to producing cashmere garments. It was this ability to produce a finished product, together with the quotas, that enabled western stores to offer cashmere at such radically reduced prices. So part of what you pay for is location. Scottish and Italian factories will tell you that with their cashmere comes more attention to detail, more quality control and more ethical production. I don’t know (and Intelligent Life didn’t mention) anything about the truth of these points. The Chinese factories certainly make it greater bulk – up to 400,000 pieces a day in one case. But their standards are also getting better every year. There are definitely differences in quality between cashmeres, though. 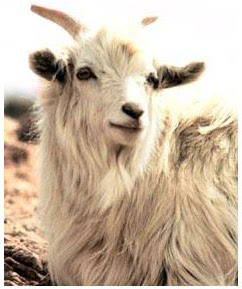 Cashmere is the long-haired wool that goats grow as an extra coat in the winter. It falls off in the Spring unless the farmers comb it off. Once it is combed, the cashmere needs to be spun to separate any remaining short body hairs. Some producers don’t bother to do this. There are also short and long cashmere hairs. The longer the hair, the more robust the product will be that is woven from it. You can spot short hairs (and the shorter body hair) by looking at the surface – the fluffier and fuzzier it is, the more hair ends are standing up. Shorter hairs will also pill more, though this can happen to all products (better cashmere should pill less after its first wash). Be suspicious of sweaters that feel too soft immediately. Like many things of value, good cashmere will be feel better and softer over time (and with occasional washes). The product will last longer as well. Finally, cheap products tend to be woven thinly. So the sweater up to the light – better ones will tend to be denser, because more wool has been used and because of the longer hairs. There are also figures for the length and width of hairs. Good cashmere is around 35-40mm in length, 15 microns in width; top producers compete over each micron. It is also slightly harder, and so more expensive, to create strong colours – cream, brown and grey are far easier than plum, orange or pink. The whiter raw cashmere is, the more expensive it is but the easier to dye. But this is just for the really high-end. The biggest price difference is due to purity, location and weaving. So what’s the best value for money? Unsurprisingly, small brands that produce great product yet don’t pay for marketing, stores or advertising. The article mentioned Pure Collection as a good example (www.purecollectioncashmere.com). Thanks for the journalism, Intelligent Life. You can follow the discussion on Get value for money in cashmere by entering your email address in the box below. You will then receive an email every time a new comment is added. These will also contain a link to a page where you can stop the alerts, and remove all of your related data from the site. Would it be possible for you to rate some of the known cashmere manufacturers/brands according to quality, value for money and style? I would be honored if you wrote a blog post explaining all the above. Thanks. It’s very hard for me to rate the quality of cashmeres, as good cashmere largely shows its quality over time (gets better with age and washing, rather than worse). However, there is a huge difference in quality between things called cashmere on the market. I would suggest just buying whatever you like the feel of, and seeing how it lasts and wears. Thanks Simon, I will follow your advice.